I am 37 years old I have five children ages 21,19,17,16, and 14. I am divorced and single. I work a full-time job and sometimes I struggle still make things all add up at the end of the month. Living from paycheck-to-paycheck is horrible but you can’t really save enough to use days when you have five children and the cost of living is so high right now. I’m grateful for what I have and what I’ve accomplished. I get by, but I don’t have any room for extras or you know the special things that we want to do for ourselves and for our children. We don’t have any room for that in our budget. Zebit has helped me purchase some of these things for my children. My biggest obstacle was going from married with two incomes in the household raising five children, to single raising 5 children by myself on 1 income. eCertificates have been a lifesaver for me. I was able to buy my kids what they wanted not just what they needed. Zebit has given me a place to turn when times are hard and I can’t spend a lot on something. The payments are truly affordable and I don’t miss it from my check. Not like places that say one price and change on the next payment. Thank you! Zebit is a truly awesome business!!! 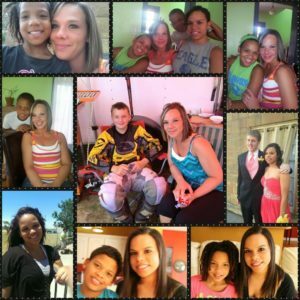 Overcoming my fears of being a single mom and not being able to make it out here in the world. A high school diploma is as far as I got, and for me to be making what I am today, and to be the position I am at my job, I am grateful and thankful. That just goes to show that anybody can overcome anything they put in front of them. If I can do it, so can you. Truly awesome site that is exactly what they say they are. No hidden agendas, no hidden fees. I absolutely recommend this site to anybody and everybody. Hands down perfect perfect perfect. For being chosen as Zebit’s Member Spotlight, Stephanie selected a $50 Hotels.com eCertificate. Thank you for sharing your amazing story. I am encouraged to persevere through all. I truly can relate.This story rings true for so many in this economy today.Best wishes.